Made from a fashionable top quality patent leather. Either "snake" or "mock croc" patterning in either elegant black or a sophisticated dark brown as well as a grey mock croc. Aspire lives up to it's name - a fabulous mid heel boot with an elegant scissored toe shape that looks equally smart at work or in the evening. Black and grey versions have a wonderfully soft red pig skin leather lining for the ultimate in style and comfort, we suggest teaming brown versions chocolate brown linings - let us know at time of order if you prefer red. Photos show Aspire in black snake, one foot close-up is of black croc with its larger tiled pattern. The heel is 6cm high and the profile of the heel is flattering but stable making it easy to walk on. 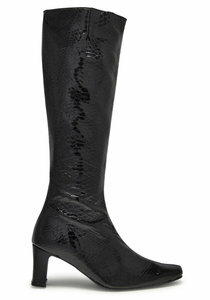 A full length inside zip, cusioned heel insert and concealed stretch panel at the top of the boot. Elegance, comfort and practicality - the hallmarks of all The BootMakers bespoke tailored boots. The ankle of Aspire is quite tailored so for those of you with calves 40 cms or more your ankle should be measured approx 7 cms above the ankle bone to ensure a comfortable fit.